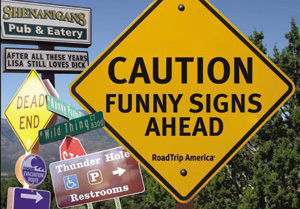 RoadTrip America's CAUTION: FUNNY SIGNS AHEAD is available through Amazon.com and at bookstores nationwide! Reflecting over a decade's worth of collecting actual mixed-up marquees, billboard blunders and signs of all types seen along city streets and country roads, major freeways and back roads, CAUTION: FUNNY SIGNS AHEAD features images captured by 95 photographers from all over the United States, Canada, and beyond. Check out the list of contributors! Fun signs from the side of the road, shop fronts and those wonderfully-American boards where they can change the message every day. From the rude (Beaver Liquor Inc.), through unthinking juxtapositions (Cemetery Lane / Dead End) to the plain unfathomable (Cat Crap), this is a great read and an even better gift. "There are some street signs that cause double takes, restaurant names that will give you pause, and an amazing number of signs that include the word "dump" in an incongruous manner. If yor're looking for a gift for someone who loves to laugh, you've found it." "Caution: Funny Signs Ahead is an extensive collection of bizarre, humorous, and otherwise visually-arresting signs rounded up for your enjoyment. This roadie's personal favorites include 'No Smoking on Campus Prohibited' and 'Brakeless Trucks Use Freeway'"
You'll definitely enjoy Caution: Funny Signs Ahead. My favorite is the motel in South Dakota that proudly advertises, "Imaginary Friends Stay Free." Eric Peterson, author of Ramble: A Field Guide to the U.S.A. "...I loved National Lampoon's True Facts books that featured humorous road signs and billboards, but that was 20 years ago. Caution: Funny Signs Ahead is a wacky collection of unintentionally hilarious wordings..."
"This is the perfect 'anytime' gift book -- don't take a bottle of wine -- buy a bunch of these and take one next time! This book deserves a sequel already." "This is a collection of some of the funniest signs on the road, photographed by ordinary people. It's just not possible to look through them without laughing! Perfect stocking stuffer for Christmas." "For the small price, it is the perfect item for that office gift exchange. This book would be a great addition to any coffee table and I'm ordering a copy for each of my family members..."
"Prepare to spend some time there, because you can't just look at one sign and move on. If you're like me, you'll 'just one more' your way through the entire online collection." "I was trying to find something different AND special for Christmas this year. I found it in this hilarious book -- my cheeks (facial) are sore from laughing so hard. Don't miss a chance to own this book. "It would be a great gift -- a perfect way to light up someone's day..."
"If you've just had words with a coworker, your dog died, or you're just having a bad day, Caution: Funny Signs Ahead is the perfect way to just yourself a lift..."